Hi - How do you Model sloped Fork Crowns to get the proper Dimensions? For instance A 7 Degree Sloped Crown and 45 degree Raked Fork Blades should be about 70mm of effective rake. There doesn't seem to be a way of doing this except for putting in a fork with 70mm of rake and doing the math yourself. There is the Angle Dimension Box you can change but it doesn't seem to do much. 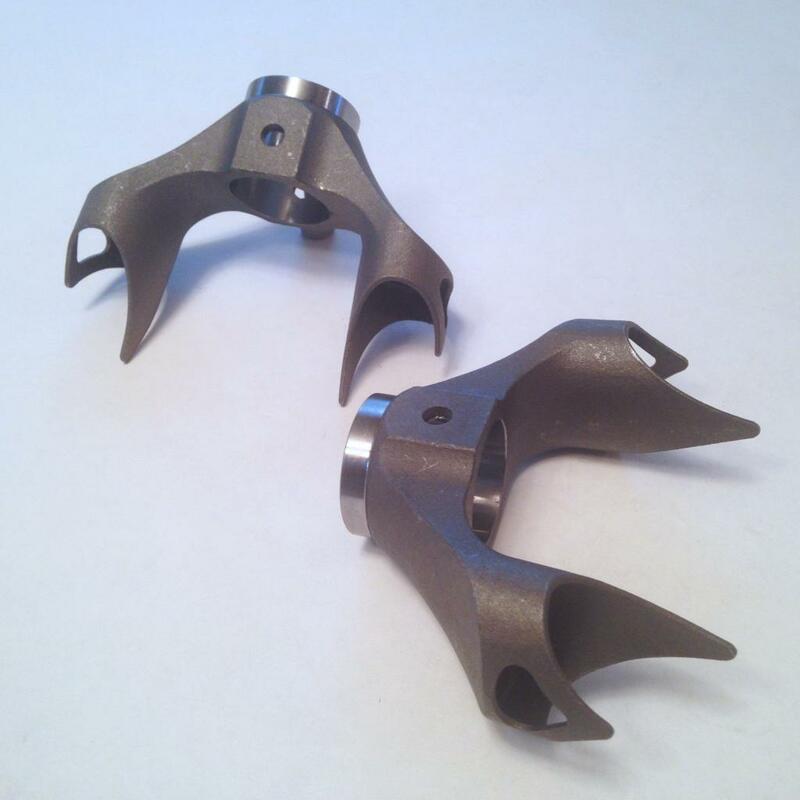 I was a little thrown off by this question because when I think of sloped fork crowns I think of ones like these below. I think of the slope as referring to how the sockets for the fork blades slope down from the top of the crown. However, I see you're talking about an angle being applied to these sockets so that even a straight blade will have some amount of rake. Currently, BikeCAD does not collect enough fork data to provide all the dimensions necessary to build forks such as these. BikeCAD has, since its inception, been primarily concerned with accounting for fork length, rake and suspension travel which are the critical dimensions required for design of the frame. BikeCAD also collects a few dimensions pertaining to the fork crown so that interference with the down tube can be investigated as described at: bikecad.ca/fork_crown_clearance, and also so that tire clearance can be checked as shown here. All the other dimensions are simply there to help capture the aesthetics of the fork. If you select a straight blade fork, then the blades will be angled at the crown. However, when modeling curved blades, the assumption is that the blades are parallel to the steerer tube until the curve begins. The θ dimension in the forks dialog box is meant to control the angle of the brake hole. This is described at: bikecad.ca/brake_hole_angle. Yes - you have it correct - I would guess that in order to model this you would need to known the distance from the top of the Fork crown to the top of the blades - no worry I can guesstimate using math. I also found blades pre-raked to 70mm (building a Rando bike next) so that solved the problem of how to get 70mm of rake without having a fork bender.